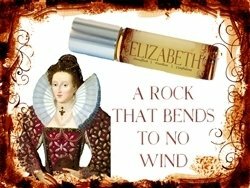 "A Rock That Bends to No Wind"
Elizabeth I was Henry VIII's daughter and a Queen in her own right. She refused to have any man in a position of authority over her, so remained unmarried. This rich blend of Ylang Ylang, Tangerine, Black Pepper & Petitgrain epitomizes Queen Bess with its fresh, floral and stimulating notes.